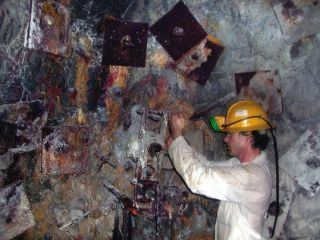 Tullis Onstott of Princeton University opens a borehole in a section of rock wall in a South African mine near where "radiation eating microbes" were found. If you're on a quest for "worms from Hell," you have to be prepared for some tough going. You have to be an intrepid adventurer and a scientific risk-taker, someone with a high tolerance for discomfort and, of course, heat. Gaetan Borgonie, a nematode specialist from Belgium, is such a person, and as a result the world now knows something new and quite surprising about the world deep below the Earth’s surface: It is home not only to single-cell microbes, but also to far more complex creatures such as nematodes, which have thousands of cells. Borgonie's discovery, reported in the June 2 edition of the journal Nature, was the result of some 25 trips down into the deepest cuts in the world, the gold and platinum mines of South Africa. His journeys into the lairs of some of the world’s most extreme extremophiles took him as deep as 2.5 miles into the Earth, and allowed him to bring back some living samples that – once put in a culture and petri dish – began to wiggle and squirm. Borgonie and his colleagues tend to be matter-of-fact about the nature and hardship of their search, but finding the "worms from Hell" took stamina and remarkable drive. I know because for two descents, or "safaris" as they are sometimes called, I joined them in their quest. While Onstott couldn't be in South Africa when I visited, I traveled with the South African team that has been instrumental in Onstott's success. Based at the University of the Free State at Bloemfontein, the group led by a dynamic young biochemist named Esta van Heerden and a veteran chemist Derek Litthauer, who now searches for novel genes and proteins in the deep mines. As it turned out, when I showed up the team also had a visiting colleague – Borgonie. Like Onstott before him, he had a hunch: that the life deep underground would not all be microbial. Yes, the pressures and heat would be high and the level of oxygen would be low. But since nematodes, or roundworms, are hardy and widespread, Borgonie saw no compelling reason why they in particular wouldn’t be found in the deep mines – despite the generally accepted view that their range was limited to about 20 feet below the surface. When I arrived he already had a few deep mine samples, but not enough to actually write a paper on them. A dead end in a mine tunnel where water kept leaking in. The mine owners had tried to stop the leakage with steel braces, big pumps and lots of other metal that, within 6 years or so, began to look like a long-ago ship wreck. Our first descent together was at the Star Diamond Mine, in the bush several hours drive from Bloemfontein. A relatively small operation, we went down less than a mile to collect water samples and (I suspect) test out whether the journalistic guest could handle the subterranean world. Borgonie had also found some interesting nematodes carrying eggs in the stalactite cones that formed on some outcroppings and equipment, and was looking for more but came away empty-handed. The next descent would be much deeper, and to a far more expansively developed mine. The destination was the Northam Platinum Mine, and it was a day's ride from Bloemfontein, near the Crocodile River in the northeast of the country. The Northam Platinum managers had called van Heerden because they were going to close off two sections of the mine that might be of interest to her and her extremophile team. It took years to develop trust between mine owners and the scientists, but by 2009 it was quite well established. As Onstott had previously proven by collecting water from boreholes and finding bacteria in his samples, the rock formations in South Africa were ideal for subterranean life. The microbes need fractures in the rocks and they need water, and both were available. The logic of Onstott's discoveries, and now the nematode discoveries, too, is that similar life is likely to be found deep underground wherever conditions allow, and that may well be under much of the Earth's surface. The trip down to our destination at Northam Platinum, Level 7, was in a fast-moving elevator. A well-organized operation with modern equipment, you could nonetheless hear rocks falling on the elevator ceiling as we sped down into darkness. A few minutes later, we came to an abrupt halt, the doors opened, and we walked in a large central cavern – complete with a miniature train system to move the mined material around. Each level has such an opening and then a maze of tunnels branching off, and we set off to some of the far reaches of the maze. Our first destination was the end of a tunnel that hadn't worked out – too much water seeped in despite efforts to staunch it and pump it out. In less than seven years, the equipment brought in had been transformed into what looked like a long-ago shipwreck, with stalactites of calcium carbonate adding to the haunted feel of the place. We all sloshed around in calf-deep water. Borgonie was ecstatic -- both the boreholes and the cones held out the promise of nematodes. He lingered after the others had left, muttering happily to himself. One of the nematodes found deep in the South African mine. But our main destination was elsewhere, and after he moved on I marched behind the others in the darkness. It was eerie, unnerving to be so far underground, so completely surrounded by rock. But the tunnel was straight and solidly dug, the ventilation brought in some fresh air and took out the noxious gases, and the periodic sight and sound of miners down branch tunnels kept things from becoming too other-worldly. I came to a junction, made a sharp left to follow the others and, with the suddenness of a fast-passing train, was staggered by a blast of heat. It wasn’t the kind of heat that brings you to a quick sweat – I was already there anyway – but the kind that grows inside your body with strenuous, or overly strenuous exertion. It was a body blow, and I reached for the wall to keep standing. Only later did I learn that both Borgonie and Litthauer have on occasion been evacuated from an especially hot or airless tunnel and sent back to the surface. Temperatures normally rise as you descend farther into the Earth, but Onstott told me the gold and diamond belt of South Africa is particularly hot below because some of its rock layers are especially prone to radioactive decay. I inched my way to the researchers and mine officials gathered ahead at another tunnel dead-end. Already the scientists had attached their equipment to a narrow metal pipe poking out from the rock and were collecting water. It was a borehole, one drilled by miners to see what conditions were like inside the rock. The temperature gauge showed the water was a scalding 120 degrees F at the end of the pipe. It was a barely touchable 130 degrees or more as it left the hard igneous rock, one of the researchers said. Mine geologist Werner Lamprecht, clearly proud of the extremity of it all, said the temperature several feet inside the rock face was probably in the range of 160 degrees. Not surprisingly, steam danced up from the water pooled on the tunnel floor. It didn't help that the water coming out of the boreholes is hot and steamy, stinks of rotten eggs, and is full of methane gas. As with the miners digging for gold, platinum and diamonds, many descents by the scientists end with no useful data at all. I sat on a discarded board beside the tunnel wall and watched. The tunnel had no insects, no spiders, none of the unexpected movement that comes with creatures, yet previous expeditions had proven that we were not alone--that even this place somehow supported life in the tiny, watery cracks in the rock. That the life could even be more complex than a single-celled microbe seemed impossible. Yet Borgonie's paper in Nature, co-authored with Onstott, van Heerden, Litthauer and others, described four tiny, yet visible to the eye, nematodes found in the three different deep mines (but not the ones we visited.) The living worm captured at greatest depth was more than 1.2 miles down, while a remnant part of a nematode was also found at 2.2 miles. The question of contamination was clearly important – were these creatures brought in to the environment on the shoes of miners or in mining water? Extensive testing – including an additional trip to South Africa to re-test some water required by the journal Nature– established the nematodes were indeed living deep in rock of the mines, feeding on the bacteria, and adapting to a dark, hot world with little oxygen. While some of the bacteria had been deep underground for millions, or tens of millions of years, the nematodes were determined to have lived at their current depth for at least 5,000 to 10,000 years. To capture the remarkable setting, the team named one previously unknown nematode Halicephalobusmephisto, a reference to Faust and his demon of the underworld. It took many months for the paper to be finalized and published, but when it appeared news of the "worms from Hell" spread around the world. It also impressed many scientists in the field, as described by Oregon State University’s Frederick Colwell. He already knew something of the discovery, but said it surprised many who never conceived of the possibility of finding complex life at such depths. "This is a new finding that is definitely striking to the scientific community," he said. Colwell is active in the Deep Carbon Observatory project at the Carnegie Institution of Washington, and is organizing a "census" of life underground. The "worms from Hell" are an important addition to their understanding of Earth, he said, and a potentially significant advance for astrobiology too. "People have had to rethink assumptions about possible life on Mars or other planets," he said. "If more complex life can exist at depth on Earth, then the chances that it could elsewhere clearly go up." For Borgonie, worldwide interest in the “worms from Hell” has been something of a surprise – nematode news seldom gets such attention. Now he wants to sequence the genome of H. mephistoto find more of its secrets. The search for subterranean worms was a high-stakes gamble with many naysayers – including at his own university – but that is often the backdrop to significant discoveries. "In science, the first time someone proposes something unusual the reaction is almost always negative," he would later say. "Meteorites killed off the dinosaurs; at first they all said 'Ha, ha.' Ten years later they said maybe it was possible. And ten years after that, people say, yeah, well, of course." He was talking about dinosaurs, but obviously thinking of nematodes in the deep. Now, he hopes, other researchers will join the search for nematodes – and other complex life-forms – deep underground, and continue the process of re-defining the nature and spread of life on Earth and the possibilities for life beyond our planet.